An Iconic design that was only made possible through computer technology. Developed as a cooperation between the Fachschule für Holztechnik Hamburg (Hamburg school for timber technology) and Swiss manufacturer schindlersalmerón. 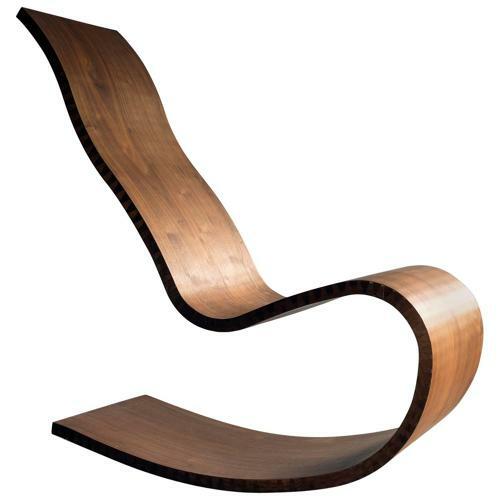 This is a cantilevering rocking chair, the Ziprocker, made from walnut and cherry wood. ZipShape is a universal method that makes it possible to fabricate single curved panels from any plain material without molds. An element consists of two individually slotted panels that interlock when bent to the predefined curvature. 13 of these chairs exist.